Track 01: “From Far Away” – In the press release, Schofield comments, “I’m a big lover of science, humanism and their related philosophies. Lyrically, I have known for a long time that I wanted to do something inspired by [Carl] Sagan’s incredible and inspiring monologue ‘Pale Blue Dot’ – this song is my tribute to his beautiful, stirring words.” “From Far Away” captures the intensity and complexity of our universe, especially via Matt’s constellations of electric guitar notes. Calling not only Carl Sagan but Eric Clapton to mind, this opener will put one in a trance. Track 02: “Clean Break” – Many if not most of us would like to believe love lasts forever. When it doesn’t, as this classic blues shuffle shows, sometimes the best thing to do is call it quits. “Stakes are too high to keep playing at your table. Can’t lose it all – I’m out while I’m still able. Time for separate ways; we gave it our best shot. Well, while we’re standing here, forget the sucker card!” The keyboard and guitar riffs in the middle pack quite a punch. Track 10: “Tell Me Some Lies” – Hot and danceable Texas blues rock is on the menu, if not honesty. Our narrator doesn’t want to hear the real story from his unfaithful lover: “Sitting at a bar, taking off your ring. You know I forgive you, forgive anything. I know who you are. I know what you do, so tell me some lies. Don’t tell me the truth.” Some listeners may characterize this song as pure rock and roll featuring sizzling saloon piano, but whatever it is, it’s super-catchy. 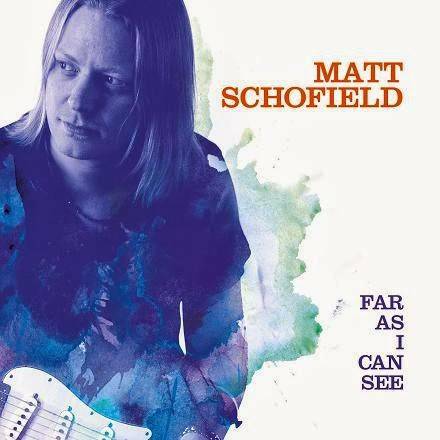 As “Far As I Can See”, Matt Schofield is on a roll, and so is his sheer mastery of the guitar!